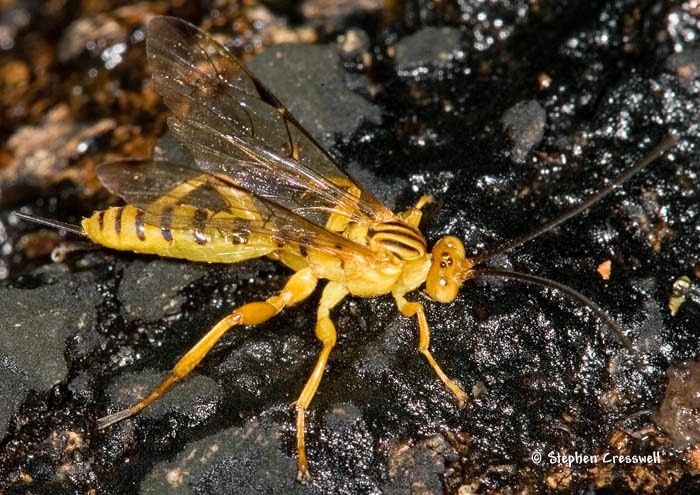 Catalogue of Organisms: Wasps with Fangs on their Feet? 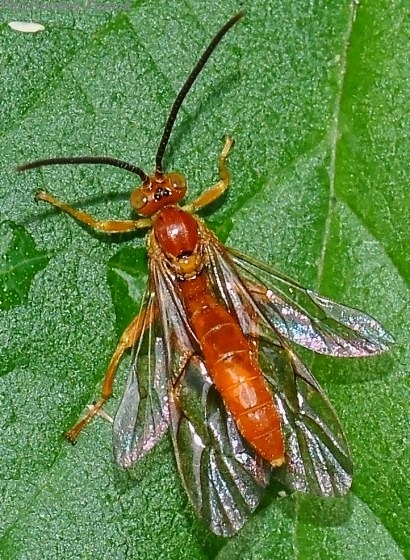 Theronia septentrionalis, photographed by Stephen Cresswell. The ichneumons are one of the more familiar groups of parasitoid wasps for the general public. The species in the photo above is a member of the Theronia group of ichneumons, which attain a reasonable size by wasp standards (a number of species seem to be in the range of 1.5 centimetres long) and are often brightly coloured in yellow or green. The Theronia group is primarily tropical in distribution, though some species are found in more temperate regions. Authors have differed on whether they treat this group as a single genus or divide it between about half a dozen genera; either option is complicated by the fact that both the group as a whole and some of its constituent restricted genera are doubtfully monophyletic (Gauld et al. 2002). Where their larval hosts are known, many members of the Theronia group are endoparasitic in moth cocoons (including some economically significant pests such as the gypsy moth), though at least some species are not parasites of the moth itself but are hyperparasites of other ichneumon larvae attacking the moth. One (sub)genus, Nomosphecia, includes parasites of vespid wasp larvae (Gauld 1984). Male Theronia atalantae, photographed by Phil Huntley-Franck. Bright colours are often a sign of danger in the animal kingdom, and the Theronia group seem to follow that trend. One of the group's distinctive features is larged, curved claws with an associated spatulate bristle. As noted by Gauld (1984), "When caught they sink their large claws into their captor." This sounds uncomfortable enough in itself, especially as said claws have a tendency to break and leave their tips embedded in the skin if the wasp is not allowed to remove them in her own time. But there's more: the inside of the claw bears a fluid-filled cavity, and the act of embedding the claws releases the contents of this cavity into the wound. In other words, the claws seem to function in much the same way as the fangs of a venomous snake. Or do they? We know that the fluid injected by Theronia into would-be attackers can cause irritation to vertebrate epithelium (Gauld et al. 2002), but we don't seem to know just what it contains or how it acts. As such, we don't know how confident we can be that the fluid is indeed effective defensively. Theronia may have poison claws that act like fangs. Or it may just have big sharp claws, and that may be enough. Gauld, I. D. 1984. An Introduction to the Ichneumonidae of Australia. British Museum (Natural History). Gauld, I. D., D. B. Wahl & G. R. Broad. 2002. The suprageneric groups of the Pimplinae (Hymenoptera: Ichneumonidae): a cladistic re-evaluation and evolutionary biological study. Zoological Journal of the Linnean Society 136: 421-485. Does anyone happen to have a picture of these claws? The only diagram I found (in Gauld et al. 2002) just shows the external appearance, it doesn't indicate the fluid vesicle.